On day 4 of our 10 days of Thanksgiving, we trust that your appetizers are all taken care of and will move onto side dishes! 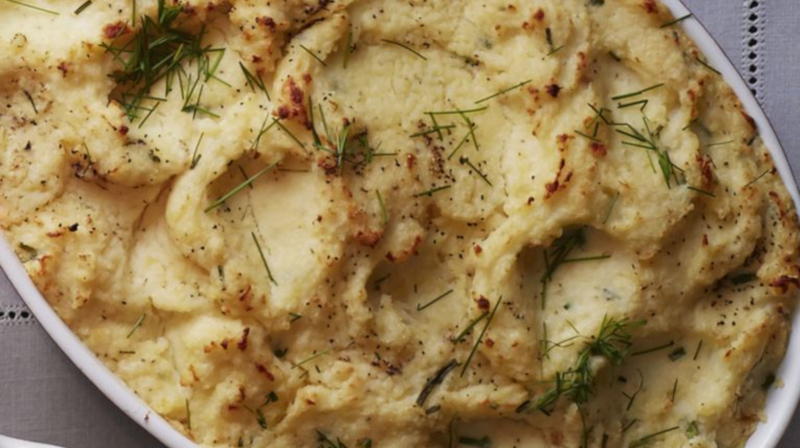 For this year’s Thanksgiving side dish, we are suggesting you ditch the boxed potatoes and make this luxurious take on mashed potatoes with Arps Dairy Buttermilk and a full-flavor Boursin cheese. It will not disappoint! Bring potatoes and cold salted water to cover to a boil in a large Dutch oven. Boil 20 to 25 minutes or until tender; drain. Let stand until cool enough to handle and peel. Preheat oven to 400 degrees F. Press peeled potatoes through a potato ricer or food mill into a large bowl. Lightly fold cheese, 4 tablespoons butter, and next 3 ingredients into potatoes. Stir in 1 3/4 to 2 1/4 cups Arps Dairy Buttermilk, stirring just until smooth and fluffy (do not over- mix). Spoon into a lightly greased 3-quart baking dish. Dot top of potatoes with remaining 2 tablespoons butter and cover with aluminum foil. Bake, covered, at 400 degrees F for 30 minutes. Uncover and bake 10 more minutes or until thoroughly heated. Sprinkle with additional chives before serving.